I then added the hat, this is made from a bit of 350 and a 160, it is then attached to the knot of the orange balloon. The Arms come next, these are 2 orange 160s attached to the first 2 raisin twists, then the legs are made from half an orange 260 each, again they are attached to the last 2 raisin twists. 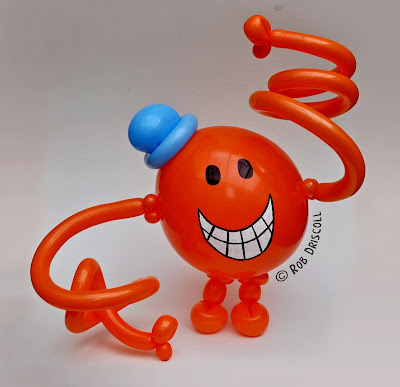 If you are unfamiliar with balloon modelling and balloon sizes then here is a guide - a 160 balloon is 1 inch diameter and 60 inches long, a 260 is 2" by 60" long, 350 is 3" by 50", you also get 5" rounds which are exactly what it says on the packet - 5 inch and round, then there are 11" rounds. There are a host of other shapes and sizes including donuts, bees and hearts but keep watching and I will tell you about those when I use them next.